This savory and delicious pressure cooker beef stew has been adapted as an easy and super fast pressure cooker recipe that’s hard to beat. Mix Flour, Salt and Pepper in a large bowl. Add cubed Beef and roll until well coated. Add Olive Oil to pressure cooker, then add the coated Beef and remaining flour. Press “Brown” button on Control Panel of your 6 Qt. electric Pressure Cooker, fry in your stove-top model. The light will start flashing and display will show “0.0”. Leave lid off while browning. Press ‘START.STOP‘ button to begin heating. Indicator light will stop flashing. Add Beef and turn every 2 minutes until browned. When Beef is browned (do not drain), add Water, Paprika, Rosemary, Thyme, Bay Leaf, Onions, and Garlic. Turn Pressure Regulator Knob to “Pressure” or “Seal” (see note below). The set Pressure Button on Control Panel on “HIGH“. Set desired cooking time by pressing the ‘HIGH’ button once for each minute or hold down continuously until desired time is reached. Set to 15 minutes. Press START/STOP button to make sure unit is completely off. Turn Pressure Regulator Knob to “STEAM” or “VENT” (see note below) in short bursts and allow pressure to release. Remove lid and add remaining ingredients (Carrots, Potatoes, Peas or Celery). Replace and lock lid onto cooker, set to ‘Pressure’ and cook another 10 minutes on “HIGH“. After cooker beeps indicating cooking time has been reached, turn off, unplug cooker from outlet and follow Step 11. 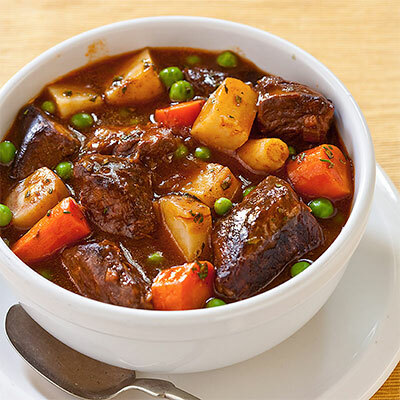 This Delicious Pressure Cooker Beef Stew serves 5-8 hungry adults, and goes great with Buttered Rolls and/or a tossed salad. 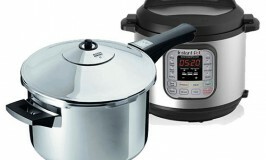 Click here to see the Top Rated Electric Pressure Cookers on Amazon. hi There. I don,t have a pressure cooker can I use a Dutch kitchen that I thought I can done this in oven. I just made your recipe in my Fagor Splendid pressure cooker, and it came out delicious. The meat and vegetables are done to perfection, and the gravy is a perfect consistency. The only deviation I made was to deglaze the pan with 1/4 cup of red wine after the meat was seared, and to reduce it down before adding the beef broth. I made this stew tonight for dinner and it was delicious and so easy. I have the Lux Instand Pot Pressure Cooker, have never used one before but i had been looking for recipes for it and i came across this recipe, so i am going to try it in my Instant Pot its the 7 n 1 6qt so i am hoping it turns out how its supposed to. Best recipe I’ve come across for beef stew. My recipe usually comes out bland but this recipe is perfect. My husband loved it as well. However, I replaced the potatoes, carrots and celery with sweet peas and replaced salt and pepper with Tony Chachere’s seasoning. Hi Mark, I have a question, the stew you posted on line sounds very yummy, following your suggestions was very clear, but how long do you cook the stew for or where can I find a time cooking schedule. I have had my 4qt Elite digital pressure cooker for 2 years I would like to learn how to use it. Can you please help me? Hi, I’m not Mark but…In my Ambiano pot from Aldi I have made this twice. Each time I have had to turn it back on to cook longer. So this time, right now I’m going to cook it for 25min. It says 10 but I have had hard carrots and potatoes each time. But the flavor is great. I agree. I just made it a second time and will cook the meat for 25 minutes and veggies 15-20 minutes next time. Great flavor! Howrver, after my second try tonight I agree that 25 minutes is needed for meat, and 15 for veggies. Made this tonight and it was excellent!!!! That fantaastic, glad to hear it! Thank you. any adjustments for 10 qt cooker ? The time to pressure depends on the fullness of your pressure cooker. A larger pressure cooker will have a larger cooking pot to heat up and usually a larger volume of food. However, larger electric pressure cookers also have higher wattage heating elements to make up for this. Given that you want to cook this same volume of food in a larger pot will mean that your cooker should come up to pressure quicker. So I don’t think the difference in size will matter so much in this respect. More important is the liquid requirement of your cooker. As pressure cooker size increases, so does the minimum liquid requirement. While a small 2-quart pressure cooker only needs about 1/2 cup of liquid to reach pressure, a much larger 10-quart pressure cooker might need two cups or more to be able to establish pressure. Although this recipe is geared towards a 6-quart cooking pot, it calls for enough liquid for your cooker to establish pressure. Also, I don’t believe that you’ll need to make any cook-time adjustment either. Just made this for dinner. Best stew I have ever made. Messed up and dumped it all together before reading it was a 2 step process. I added sweet potatoes with the potatoes, carrots and celery. Cooked for 15 minutes then waited about 10 minutes before releasing the pressure. Will be making this again. Thanks Mark. I had high hopes for this recipe, but it was a miss for me. I made this in my 6 quart Instant Pot Duo on low pressure for 10 minutes, added veggies for 10 more minutes on low, and used quick release. I used sirloin, but meat was chewy. Veggies were not quite done (and I like them on the crunchy side.) Does anyone have suggestions? I’m so sorry, Alice. I have had success with this recipe, but because it didn’t work for you, I’m going to remake this in my cooker and make sure I have the cook-time and pressure settings right. It sounds like the meat and the veggies were under-cooked. I feel bad that it didn’t work out for you. Please accept my apologies. I’ll update this recipe if I find that it needs it. Thanks, Mark! I’ll look for your update. The next day I cooked the meat any gravy for about 1/2 hour on the stove to soften the meat. Then I added the veggies back in and heated through. It was much better after cooking longer! Maybe the priblem is that you used low pressure. The recipe calls for high pressure. Alsoi saw later you did 25 min. Maybe the original time on high pressure with natural release(instead if quick release) will cook to the right melt in your mouth-iness. it didn’t turn out as you didn’t follow the cooking instructions 15 minutes meat only on high then add veggies for andditional 10. It sounds as if it was undercooked. The recipe calls for high pressure. Cooking on low pressure will yield undercooked meat and veggies. I just received a pressure cooker for Christmas. It is a stove top model. Would I go to the 2nd red ring for each 10 minute cooking time? How do i change for 8 qt pressure cooker. Thank you so much for this recipe. First time making beef stew, first time using my xmas gift, Crock Pot – Pressure Cooker and first time reading your page. A Rump roast is a somewhat tougher cut of meat with some marbling. Rump roast has great flavor, so it’s traditionally used by deli’s as thin sliced roast beef. Because it’s a somewhat tougher cut of meat, it’s perfect for using in your pressure cooker or or slow-cooked in a crock pot. It’ll make a great meat for your beef stew! Just got a power pressure xl and was looking for a beef stew recipe. This has great reviews and will be trying this this week. Thank you Jenny, I hope it was a hit! This recipe was definitely the fastest but I also think it was the best Beef Stew I have ever made. Big hit with me. Thank you! I so pleased to hear you enjoyed it. Thank you for sharing that. Tried your recipe last night,man was it tasty. Thank you for sharing. Made this tonight. Terrific! Only tweaked it a little. I’m curious what you tweaked. Thank you for sharing your experience. I am delighted. I have been totally intimidated by my new power cooker to say nothing about making a stew. This was fabulous on all counts. My cooker slightly different but was able to make necessary adjustments. Cannot say enough about this recipe after numerous past crock pot attempts. It was delicous! Have already called my daughter and sent have sent it tonher. Thank you so much for commenting. I am so glad to hear that your beef stew was such a success. Great job! If you want the meat nice and tender buy meat whole, salt it and let it sit out for 30 min rinse and cut it yourself and trim off the fat. Best beef stew I’ve ever made. Thanks! Hey That’s great to hear Minda! Glad it went over well. Thanks for the feedback. My Instant Pot does not have these settings. I don’t know how to adjust the directions. I just got it and really don’t know how to use it. I made your recipe in my instant pot and OMG the meat and veggies so tender, I just adopted the settings to my pot and so delicious and right on point and in time. Loved this recipe!! Best beef stew ever!! I just got an insta pot and want to try this recipe. I’m not sure how to do a “low” setting. Can anyone help me? Thanks! Put on manual press minus button to get to low pressure and to 10min. Recipe had been updated to now to use high pressure. Turned out much better! This recipe sounds wonderful. I have an old fashioned pressure cooker, not electric. What are the cooking times for a stove top pressure cooker? I tried this last night for a quick dinner and it was DELICIOUS!! Thank you for sharing this. I don’t have a pressure cooker with any buttons. Suggestions? Made this tonight with a few minor adjustments. My whole family loved it! We will be adding this to our “go to” list! Definitely fast and easy. Less than 1 hour fridge to stomach. But more importantly, beats any slow cooked stew I’ve ever had. Make cleanup far easier also. Thanks for the knowledge. I’m so glad that you enjoyed your dinner. Best beef stew recipe I have ever tried and tasted. 5 star. Thanks. I agree. Best, most authentic beef stew recipe ever. And easy enough for a weeknight in the pressure cooker. Thanks bunches for this! !